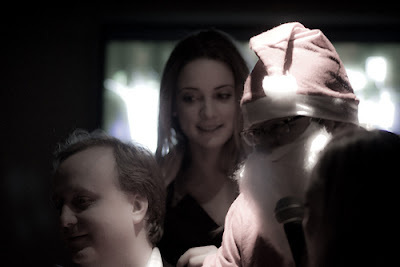 The networking part of the event featured the highly predictable scenario of a mostly male crowd, with the odd cute girl and TechCrunchUK editor Mike Butcher dressed as Santa. (c). The TechCrunchUK's Christmas Party on 16th Dec was an interesting night out. I attended the last speaking session, which consisted of entrepreneurs giving pitches to investors and the audience, as well as the networking event that followed. Riaz Kanani has a good summary of the companies that took part in this session. Most of my evening was spent in the networking party. I was surprised by the number of startup type people at the event. It felt like we were back in the age of the bedroom startups of the 80s, when people were creating games that distributors would pick up and sell to millions. Perhaps this is the power of the internet. Some of the ideas that people were working with seemed so wacky (just check Riaz's writeup of the pitching session to get an idea), that it made me think my own business startup idea is the most solid idea in the world. It was insightful learning about how people were approaching their startup problems. One person, for example was reselling open source software while adding a bit of consulting. Another was rehashing and aggregating feeds to produce their own dot com site. There were also investors there. Some of them made interesting points: Hollywood always makes the most money during a recession, so there is interest in investing in entertainment. There is also an appetite for investing in startups that create cost savings for other companies. Among others at the event, I even managed to catch up with the BBC's technology correspondant, Rory Cellan-Jones. The networking venue worked well, with plentiful of free drinks and food. TechCrunchUK have posted their own debrief. Thanks Benjamin. You took some great photos of the event.